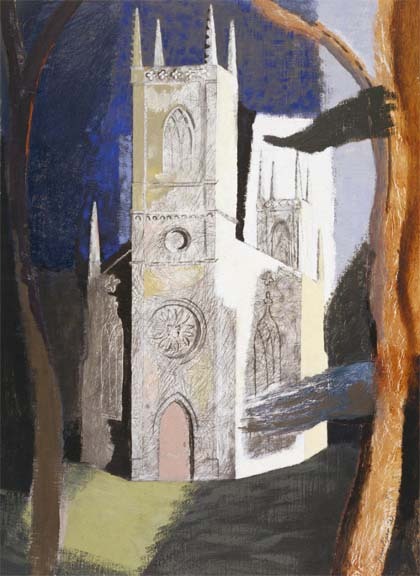 This special exhibition celebrates the contribution John Piper made to the development of modern art in British churches throughout the twentieth century. It charts his life-long fascination with, and care for, church buildings; a relationship which began as a young boy when he produced his own sketches and guidebook to the churches in his home county of Surrey. More than 70 works spanning Piper’s diverse and illustrious career are in the exhibition along with key works from public collections including the Britten-Pears Foundation; Manchester City Art Gallery; Northampton Museum and Art Gallery, Pallant House Gallery, Chichester; The Collection, Lincolnshire and the V&A. The exhibition also includes special works from private collections, most of which have been rarely seen. For the first time ever, one of each of the ecclesiastical vestments designed by John Piper for Coventry Cathedral, Chichester Cathedral, St Paul's Cathedral and the very first cope commissioned by Walter Hussey in c. 1954 are on show together. Piper's first piece of stained glass, together with his stained glass designs and cartoons, tapestries, photographs, drawings, collages, paintings and prints are also be on display in this major exhibition of his overwhelming artistic passion. A programme of lectures and concerts accompanies the exhibition, click here to book. The exhibition is curated by Patricia Jordan Evans, Director Bohun Gallery.